The Select Colour dialog box lets you set the colour of layers and columns. Using colours for layers and columns helps to differentiate them visually, making them easy to identify. 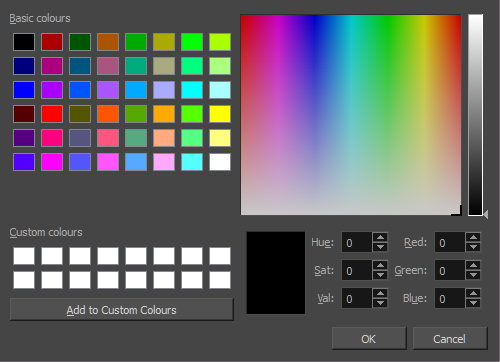 You can select a colour by choosing from a basic set of colours, using the colour wheel or by specifying the HSV or RGB values. Once you have selected a colour, you can adjust its intensity and save it as a custom colour that you can reuse. For tasks related to this dialog box, see Changing Layer and Column Colours. In the Timeline view, click the Change Track Colour button of the layer you want to modify. In the Xsheet view, select one or more columns to modify. Right-click on the column’s header and select Colour > Change Columns Colour. A basic set of colours to choose from. Displays the custom colours you previously stored using the Add to Custom Colours button. Lets you add the selected colour to the Custom colours list above. Lets you select a colour by dragging the T-shaped pointer. Once you select a colour, you can drag the slider to change the intensity and see it previewed in the Colour Preview window below.. Displays the colour you are currently selecting. To apply the colour, click OK. Lets you set the hue (colour), saturation (amount of colour) and brightness (value) of the colour. Lets you set the red, green and blue values.